DIPS is Norway’s leading supplier of hospital information systems. 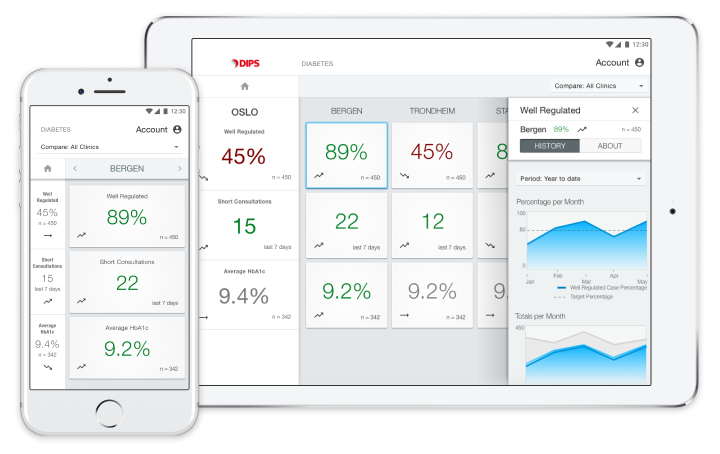 In 2015, DIPS acquired FastTrak, a producer of customizable Electronic Health Record (EHR) software that is used in almost 100% of Norwegian diabetes clinics. DIPS wanted to help specialized healthcare clinics share and compare their outcome data to improve population health. Even though outcome data existed in the EHRs, individual clinics did not have the technology to share their data with other clinics. DIPS envisioned a dashboard that used EHR data from clinical databases across Norway to display Key Performance Indicators (KPIs). In April 2017, DIPS selected RoleModel Software to build a proof-of-concept for the KPI dashboard. The prototype would demonstrate how data could flow among clinics and test hypotheses about design, technical and business risks. DIPS chose diabetes as the first of multiple therapeutic areas. RoleModel designed, developed, and deployed a complete prototype in just two weeks. The responsive mobile application included “sharing economy” features that encouraged anonymous data exchange among clinics. Clinics could see each other's data at the same level of detail that they were willing to share. The prototype used configurable business rules to display color coded numbers, graphs, and trend charts. Users could easily see their clinic’s performance and compare it to the full set of KPI data. As RoleModel developed the proof-of-concept software, the team simultaneously prioritized the remaining features needed for a Minimum Viable Product (MVP). Using rapid feedback and aggressive feature prioritization, RoleModel designed a roadmap for a production release that required just a few additional weeks of work beyond the proof-of-concept. Using agile practices, RoleModel quickly delivered the production application. DIPS began onboarding its first dashboard customers and successfully showed the software at a national meeting of diabetes clinics. DIPS management was extremely pleased that the concept had been successfully validated and the application was now a viable product that could be demonstrated to clinics throughout the country. RoleModel was a great collaborator, helping us to refine our initial software concept and quickly produce working software that gave us valuable customer feedback. © 2019 RoleModel Software, Inc.